Any true permanent makeup expert will tell you how crucial pre-drawing permanent makeup is. 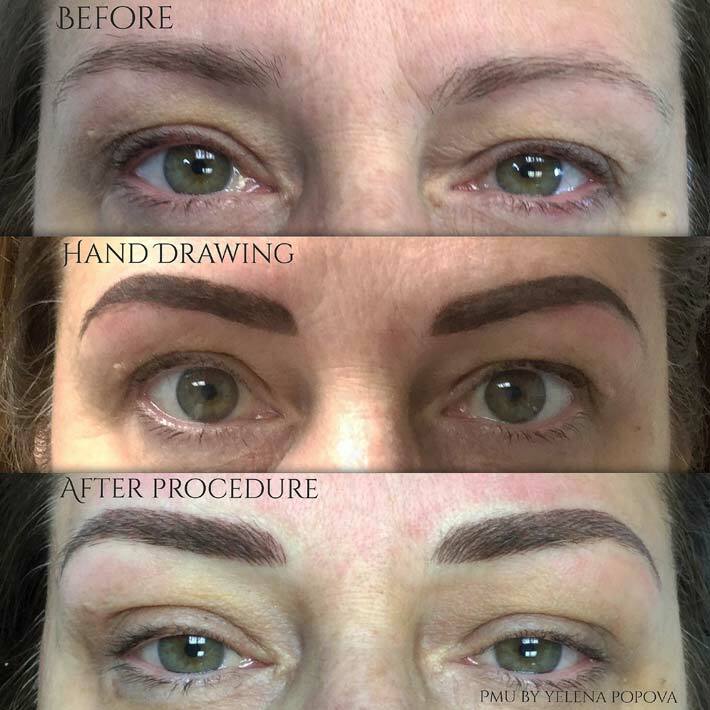 If you meet with a permanent makeup artist who does not pre-draw, that should be a red flag, as this step is paramount to ensuring your permanent makeup looks exactly how you want it to. Technicians with minimal training will rely solely on rulers, calipers, and/or templates to pre-draw, while an experienced professional will draw it all on by hand. Some may think the use of the above tools would lead to a better, more uniform outcome, and while they can certainly help, face shape, bone structure, and much more must be taken into consideration as well, which templates often do not account for. For example, very few people have a perfectly symmetrical face, so when preparing to tattoo permanent makeup eyebrows, using a template to draw on the eyebrows won’t create symmetry because the face is likely not symmetrical, and must be customized to suit that particular person. The face also curves differently from person to person, making templates even less useful. The most natural looking outcome is created when an extensively trained professional uses their sharp eyes, knowledge of face anatomy, consideration of facial features and proportions, and artistic hands to create eyebrows perfect for that individual. Permanent makeup is truly an art, and needs the touch of someone with a keen, detail-oriented eye. When you meet with your artist at your consultation, they will likely take photos and speak with you about how you’d like your permanent makeup tattoo to look. The artist will reference these photos and notes when doing the pre-draw on the day of your procedure. Pre-drawing your permanent makeup can take 30-40 minutes and helps ensure you are getting exactly what you want. Feel free to communicate with your artist on elements you’d like to change as they go. This also helps clients see an artist’s skills first hand before they get their work done. If you find your artist just isn’t producing what you’re asking for during the pre-drawing phase, it is best to end the appointment before the permanent makeup is completed and you are unhappy with the results. Once the pencil-drawn makeup is finalized and the client is completely happy with the look, the artist will leave the pencilled makeup on and use it as a guide for tattooing. Gentle, well-placed strokes create an appealing, natural look. At Novaline Permanent Cosmetics, we always pre-draw the area to make sure everything is just right before tattooing. Our highly trained and experienced experts are masters of their craft with the skills needed to create beautiful permanent makeup you can wear with confidence. To learn more about our services, feel free to give us a call anytime at (647) 883-6251.